In the Soltis lab at the University of Florida, Bryan Drew and Jiabin Deng have spent much of the past year collecting trees and alignments of green plants (Viridiplantae) as part of an effort to produce a synthetic tree that represents all of the described organisms on Earth. As part of the tree-gathering process, they have gleaned public database archives and contacted corresponding authors directly to request data. Although these methods were not as successful as had been hoped, they recovered trees from over 1000 publications involving green plants. As might be expected, some areas of the green plant tree are better resolved than others. For example, within gymnosperms and flowering plants we have authorsubmitted trees that support the monophyly of most major lineages, but for other major lineages of green plants, such as green algae and bryophytes, sampling is not as complete and those parts of the tree are not as well resolved. Fortunately, for green algae at least, help is on the way in the form of the NSF funded “Assembling the Green Algae Tree of Life” project. Although results from this project will not be incorporated into the upcoming Open Tree of Life “Big Bang Tree”, within a few years the green algae portion of the Open Tree will undoubtedly greatly benefit by inclusion of trees from the Green Algae Tree of Life project. Other parts of the green plant tree are shaping up nicely, and the Soltis lab is sending out some last minute requests to authors in an attempt to shore up regions of the tree that are presently underrepresented. Here we provide a basic summary of what we know about green plant phylogeny, stressing that there is much we still do not know about relationships in this large clade of perhaps 500,000 species. We know from the fossil record that many green plant taxa have gone extinct; these extinctions contribute to “long branches” in the Tree of Life and can make it very difficult to determine relationships between older lineages. In the green plant tree, two main clades have been recovered, the Chlorophyta and the Streptophyta. The chlorophytes contain most of what is traditionally known as green algae, while the streptophytes contain the remaining green algae as well as land plants (Embryophyta). One of the many insights provided by molecular systematics during the past twenty years is that “green algae” as long recognized are not actually a natural group (i.e., they are not monophyletic), and that some traditionally classified “green algae” are actually more closely related to land plants. 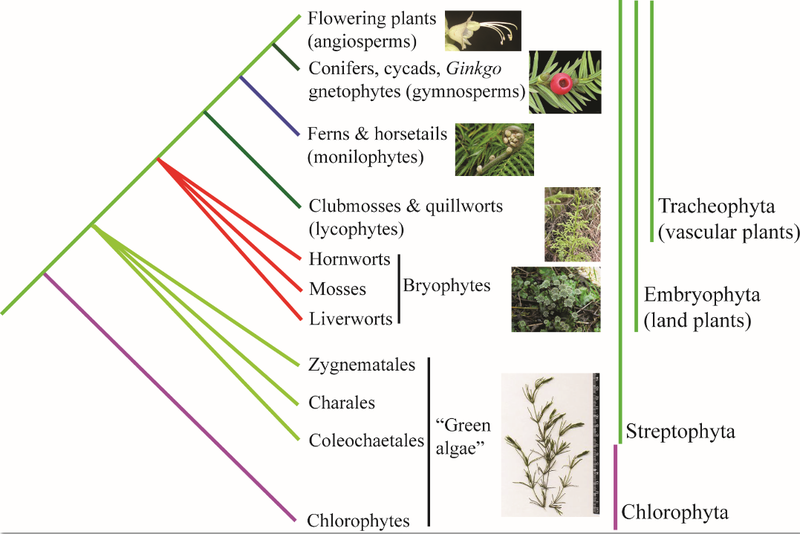 However, the closest “green algal” relative of land plants remains unclear—some studies suggest Charales whereas others indicate Zygnemetales or Coleochaetales The land plants (embryophytes) include bryophytes (mosses, hornworts, and liverworts) and vascular plants (tracheophytes). There is still some question as to whether the bryophytes are a natural group or comprise separate evolutionary lineages. The vascular plants are comprised of lycophytes (clubmosses and quillworts), monilophytes (e.g., ferns and horsetails), gymnosperms (cycads, Ginkgo, gnetophytes, and conifers), and angiosperms (flowering plants). Though the relationships of come large clades are uncertain, these uncertainties will be shown in the Big Bang tree given that we possess many of the trees that highlight these different clade placements. In other areas of the green plant tree we are sorely lacking data, and the Soltis lab (in close collaboration with Stephen Smith’s lab at the University of Michigan) is still working hard to fill in the tens of thousands of holes in the tree that remain. This is a beautiful part of the Open Tree of Life: as with the organisms that it represents, the tree is ever growing!